Simple, straightforward and proven techniques for consciously directing your empath gifts — on command. That’s what Empath Coach Rose Rosetree can teach you with Book 3 of her series of self-help books for empaths. The most sophisticated techniques around. For refining your skills to understand your empath gifts, turn them OFF as a matter of habit, and become used to positioning your consciousness in spontaneous ways that help you greatly. By the time you start reading this book, you’ve probably prepared by reading Book 1 of this series. And also you’ve gained powerful empath skills from Book 2. Note: If you haven’t read them yet, at least please follow the preceding links to read about them. This will boost your consumer’s understanding about what this particular book can do for you. And, like any relationship or skill with real oomph to it, why stop when it’s already good? When it can get better! That’s what this book is for. Deepening your empowerment as an empath. Expanding your knowledge. Along the way, you’ll understand… in a more sophisticated way… how come many “expert-prescribed” activities for empaths are, in fact, unnecessary. And—when you understand what really makes an empath’s aura tick—can’t work. Move forward along a path that’s far easier and more effective. And one that’ll leave you with an enhanced sense of self, along with greater peace of mind, clarity, and personal power. To appreciate the very significant choice that Rose offers you in this book, let’s compare the system of Empath Empowerment to each of these four, previously mentioned, Busywork Alternatives. Look, psychological work specializes in approaches like this. And many people are helped by analyzing themselves. Like the 3 out of 4 Highly Sensitive Persons (HSPs) who are NOT empaths. Empaths have a qualitatively different aura characteristics from all other humans who are not empaths. Empaths, when unskilled, develop bad habits about positioning their consciousness. Not the approaches that therapists take, helping their patients or clients, to deal with mental health problems. Changing your habits for using your empath gifts? Of course you can learn how. Especially when you understand that self-analysis and monitoring your behavior won’t begin to make a difference. “The Empowered Empath” offers you unique understanding and skills. Advanced knowledge for positioning your consciousness. Such as “Hey, You” in Chapter 6. And specialized techniques in Chapter 10 to jog you out of prolonged unskilled empath merges. Here’s another poignant example of how many empaths try to “improve” themselves in ways that don’t work. That can’t work. Raise your other hand if that boundary work helped you much. Maybe you know from personal experience… what Rose’s students have told her. Over and over again. Students from many parts of the world. Nearly every single Empath Empowerment® student has tried hard to improve their “boundaries.” Often doing grueling ongoing work. How many of those empaths felt better about themselves after failed attempts to do boundary work? None! If anything, they felt worse about themselves. So, what are you given in “The Empowered Empath” — what if not more ways to squeeze your brain by doing extra boundary work? Detailed descriptions of what happens during unskilled empath merge and prolonged unskilled empath merge. If these empaths weren’t desperate, due to lacking empath skills… they’d realize that this sort of approach doesn’t compute. Like, if the empath was using effective skills for energy healing, why have to do this all day long? Elsewhere at this website you can learn about a completely different category for RES sessions, books, and workshops. Really Effective Skills for Energy HEALING. Everybody can use these. So Rose makes these resources available to everybody. By contrast, Rose teaches Empath Empowerment skills to… empaths. And those skills have nothing to do with feeling fragile, vulnerable, miserable, cursed, etc. That’s one of the terms Rose has introduced, aiming to bring clarity to what does, and doesn’t, help people’s auras to be healthy. Regular hypochondria happens when people worry a lot about their physical health. Energy hypochondria happens when people have been taught to worry about their auras. And they really think that fussing like this is good for them. It isn’t! What Does Rose Offer Instead? In “The Empowered Empath” you’ll find an adult discussion of “Skills Versus Self-Authority.” One of many thought provoking sections of this book that get you thinking about how to empower yourself from now on. 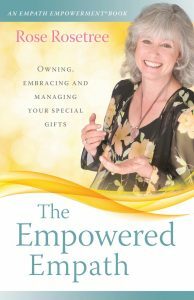 This book is jam-packed with results of Rose’s thousands of sessions and workshops, teaching empaths. Answering questions. Helping empaths to solve some problems. And avoid other problems. Respectfully, you’re given layer upon layer of discernment. Quite a refreshing contrast to mushy, vague, or misleading ideas about energy that are common in today’s busy empath marketplace. As an empath, you may have encountered advice to “protect” you. Loads of details about which kind of person is which kind of vampire. And then, supposedly, you’ll save yourself by avoiding contact with these bogey-monsters. Contrary to what you may have been told, there are no such things as “psychic vampires” or “energy vampires.” Although Rosetree does have a theory about how such ideas have developed and why they can sometimes be appealing. Disclaimer: Rose Rosetree does not know everything. But here she tells you the truth as she knows it. Long before I started to work as an Empath Coach, I began teaching energetic literacy. As a result, I’ve noticed stages of development. Stage 1 Energetic Literacy happens to complete beginners. Folks see colors or feel energies, and that’s fine as far as it goes. But the results are often inaccurate. Because the person has talent but, so far, lacks skill. Ideas like “psychic vampire” may result from noticing that people suffer. And their auras suffer. But then jumping to conclusions, supported only by Stage 1 Energetic Literacy. Although I don’t know everything, I know some things. For example, from having facilitated thousands of sessions for clients, and also from training RES Practitioners and Apprentices — each one having excellent skills of energetic literacy. Neither they nor I has ever, ever encountered a single one of these so-called “psychic vampires.” It helps that we have precision skills for Energy READING, and also effective skills for RES Energy HEALING. Of course, these practical skills aren’t theories. Our clients notice real-life results. So What Does Rose Offer Instead? Many chapters of “The Empowered Empath” help you to gain additional clarity about energies, your sense of self as an empath, and other matters where so many empaths today are taught questionable information. How can you do better? What Else Makes This Book Unique? Before we get to some very cool specifics, please do a bit of recommended reading here at the website. If you haven’t done so yet, please take a few minutes to read the full descriptions here for #1 and #2 of Rose Rosetree’s Empath Empowerment® Books. Because this Expanded Edition is Book #3 in that series. By checking out those other parts of this website, you’ll see why it’s strongly recommended that you read these other empath book first. Thereby deepening personal trust of your own empath gifts. Gaining an even higher regard for your own humanity. An appropriate sense of self-worth, based in better everyday habits of consciousness positioning. Recognizing and changing a bad habit that’s common to most unskilled empaths: Trying to solve your human problems by moving your consciousness into the experience of other people. Spontaneously increasing commitment to enjoy your own human life. Unskilled empaths are less effective than non-empaths. But skilled empaths are more effective.